The modern décor of Hotel O creates an oh-so sophisticated vibe. Though the hotel renovated its historic edifice in 2007, it retains a vintage quality that immediately charms guests. Not into the “bigger is better” philosophy, O offers intimate-sized rooms, well-suited for young couples and single travelers that prefer hotels with less of a “standardize” characteristic to their décor. The hotel’s interior design is minimalist, recreating the feel of a sleek apartment with its dark wood accents — a modern interpretation of hotel living. Outside of the hotel, travelers will enjoy the extra value of O’s central L.A. address in the city’s bustling downtown district. Within walking distance of L.A. Live, the Convention Center, Music Center and Pershing Square, there are plenty of places for visitors to go for a sight-filled stroll, on their way to a performance or exhibit. Those who’d rather save their feet from the long L.A. city blocks needn’t worry, the hotel is located near public transportation — Disneyland and Hollywood could not be any closer eager tourists. For women looking for a spa getaway, reserve the Flower Suite with your girlfriends, and Signature Experience treatments for the group at the on-site Oasis City Spa. Opened just this fall, O’s clean modern aesthetic extends through to the spa. After luxuriating in the pampering that comes with the Signature Experience package — 60-minute Signature Massage, 60-minute Signature Organic Facial, and 75-minute Signature Manicure and Pedicure — your girls’ weekend will switch into total relaxation mode. When exploring the nightlife in the buzzing downtown area (hit Bar 107 if Pabst Blue Ribbon is your drink of choice), you may miss out on Hotel O’s delicious breakfast buffest spread for want of a couple more hours of beauty sleep. Luckily for late risers, the hotel’s Bar | Kitchen restaurant opens just in time to serve you a hangover remedy: hair of the dog. Try the Faster Young Fruit cocktail, its mixture of potato vodka, blanc vermouth, lemon, grapefruit, seltzer will settle your stomach, and ease the ache tapping at your temples. We like this bevy best served with the kitchen’s delicious turkey pastrami sandwich with celery & apple slaw. Understated glamour fitted with luxury treatment, the Hotel O offers a unique experience for urbanites that are too cool for over-the-top glitz and glam, and more about simple living that just happens to be on trend. The history surrounding Hotel St. Paul is a glorious vision, made more luscious by the complement of the hotel’s opulent interior. Located in beautiful Old Montreal, this luxury boutique hotel is a meditation on grand loft living. Sleek and modern in design, the spacious penthouse suites are outfitted with contemporary homeware with antique appeal (think Britain’s Rockett St George), and boasts 13-foot vaulted ceilings with spectacular views of the city. The hotel was one of the highest building in the area when originally built in 1908, and its height continues to afford it a scenic position. So trendy that as you lounge in the hotel’s spacious red-accented atrium, you are half waiting to see a pop star stroll in and join you in the sunny room; and yet still, despite all its clean lines and moody colour palette, the hotel is instantly inviting. The modern romance of the suites at Hotel St. Paul — anchored by warm decor elements such the hotel’s stylish take on canopy beds — callout to guests, beckoning them back, tempting them to stay in with a bottle of wine back in the room. When finally able to bear leaving the suite, the arts will be on your mind given your temporary accommodations, and its place amongst the neighbourhood’s cultural plenty. Be sure to make the jaunt over to the Montreal Museum of Fine Arts for the showing of “Once Upon a Time… Impressionism, ” if visiting before January 20th, then finish the afternoon with a browse through the shops speckling the streets around the hotel including Denis Gagnon’s boutique, one of our personal favorite local designers. End the day with an evening bang, and nab tickets to Cirque De Soleil’s Saltimbanco, on over the holiday season at the Bell Center till December 30. 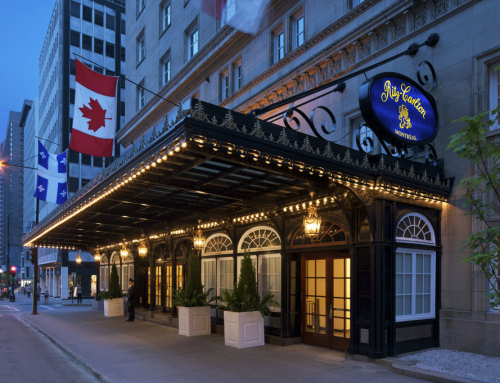 Montreal is a chilly place come winter; after a full day of breathing in the cool Canadian air, settle in at the hotel’s new Hambar restaurant, and escape to a place where New York meets Europe. Here, warm up with one of the rare vintage wines listed by Philippe Poitras, and partake in the many varieties of ham on offer — yes, Hambar is quite literally a ham bar, serving up specialty hams from Spain and Italy. But fret not non-ham fans, this hip little restaurant also lists menu items from oysters to duck to satiate your appetite. When in snowy Montreal for a visit, there is no better place to cuddle up in a faux fur throw, and sip apple cider while soaking in a singular view of the city, than in the comfort of a Hotel St. Paul suite. In our experience, every stay at a Thompson hotel is a visit that leaves one yearning to pop into another location for an extended vacation. Our most recent stopover at 60 Thompson once again confirmed that fact. Located in New York’s fashionable SoHo district, 60 Thompson is a hotel with a firm grasp on the desires of the well-heeled traveler. Topping the wish list is luxury and exclusivity — two areas of comfort the hotel offers in spades. Proof: mini bars stocked with gourmet snacks by Dean & Deluca, and guest bathrooms with amenities by Kiehl’s. Reserve the Thompson Loft, and open the door to life as a New Yorker. Measuring at 1,800 square feet, this home-away-from-home is the apartment you dreamed of owning in the city that never sleeps, back when you were still too young to truly understand the moral of Big. When booking this room, you get a private balcony that looks out onto the New York City skyline, without a block of skyscrapers obstructing your view, a truly stunning sight when seen through the room’s oversized cathedral windows — need we say more? As for extracurricular activities: shop, shop, shop is the mandate of many a guest who book their New York holiday at the ideally located 60 Thompson. From the vintage wonderland that is What Goes Around Comes Around to the glossy shopaholic coliseum known as Bloomingdale’s, credit cards are easy to max when perusing the shops around the hotel. Once arms are full with new wardrobe delights, return to the hotel for an early evening cocktail at Thom Bar, paired with Asian-inspired small bites from Kittichai including Grade A “Meing” tuna tartare limestone tartlets and crispy rock shrimp served with grilled eggplant and palm sugar-tamarind sauce. The locals hold dishes from the kitchen here in high regards; the combo of delicious Thai cuisine and an intimate moody atmosphere has earned it a top placing with savvy foodies. Also reigning high on the local favourites scale, the A60 seasonal rooftop bar — open exclusively to hotel guests and members — which offers one of the most spectacular views of the Manhattan skyline to raise a glass to. Should the finer things in life tickle you from head to toe, 60 Thompson will leave you giggling in bliss from check-in to checkout.